I’d also like to add that there are several HUGE displays at parks, etc. The only one in the Lake Norman area is Zootastic; but, if you are up for the drive, I highly recommend going to Winston-Salem and seeing the lights at Tanglewood Park. McAdenville is another one that many people like to take a drive out to go see. That’s an entire town lit up and it’s FREE! There’s also the Charlotte Speedway but that is a bit pricier. This blog focuses mainly on smaller, private displays in the Lake Norman area but I didn’t want to leave out those large displays that are so popular. 2013 Christmas Vacation Theme from Adam Coleman on Vimeo. This is located in Curtis Pond neighborhood and is our FEATURED IMAGE. We have never seen so many decorations in one yard – EVER! For displays without the musical show – this one is the clear winner! Located in downtown Mooresville, NC the James Family Christmas lights show is a computer controlled show with music and lights. This is an annual show with over 75,000 lights. The sound is transmitted over a radio station which you can tune into at the show. This is a great show loved by the locals and is definitely worth seeing. Note to locals – the show has been updated this year! #4 – Zimnowski Light Show (big animated show) This one is is one of our favorites and is sure to please! They are on Facebook under “Zimnowski Light Show”. chocolate nights on Saturdays (weather permitting). Tune radio to 89.3 FM and enjoy! The Lights of Raz – 315 Ramano Dr., Iron Station, NC 28080 – Over 200 inflatables, walking path (so you won’t trip on wires), music, fire pits and more! Rides, Pictures with Santa and one of our animal babies, and SO MUCH MORE!! They will also be offering wagon rides through the lights at no additional cost on Monday, Tuesday, and Wednesday nights. Admission $7.00 per person (includes driving through the lights and walking through the zoo). looking balls hanging in trees right near it that just made our jaws drop!) This is a MUST SEE!! 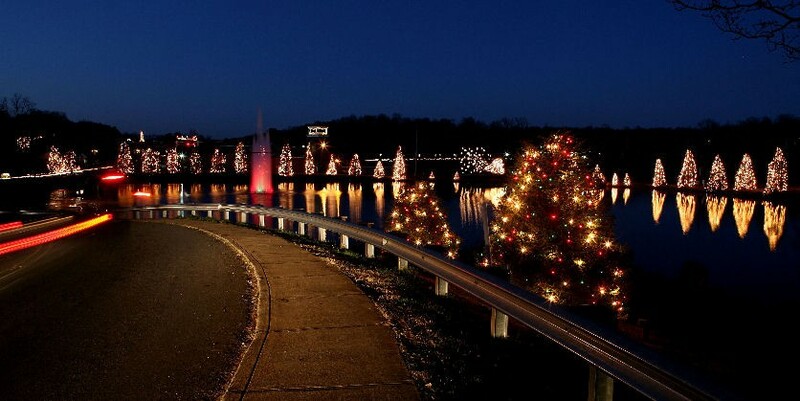 CURTIS POND – now this neighborhood takes the prize for Christmas spirit in Mooresville! There are lots of displays in here. FRANKLIN GROVE – We found some nice displays in this neighborhood. Be sure to take all the side streets. also drive down Pleasant Grove Ln. SUNDOWN COVE neighborhood located off Sundown Rd off Williamson Rd has some great displays. CHERRY GROVE – We found many nice displays here although they were scattered about in a large neighborhood. This post is from 2014. For the most recent post on holiday lights with over 50 displays listed click here. It’s Christmas time! There are many fun things to do this time of year in and around the Lake Norman and Charlotte area. Our family so enjoys riding around and seeing all of the great decorations and lights this time of year. I wanted to share with you some of our favorites in the area so that you can take your family and enjoy them too. If you find other great light displays, please share them with us too! BTW – if you are looking to buy a house so you can decorate with lots of lights- contact us! Located in downtown Mooresville, NC the James Family Christmas show is a computer controlled show with music and lights. This is an annual show with over 75,000 lights. The sound is transmitted over a radio station which you can tune into at the show. This is a great show loved by the locals and is definitely worth seeing. 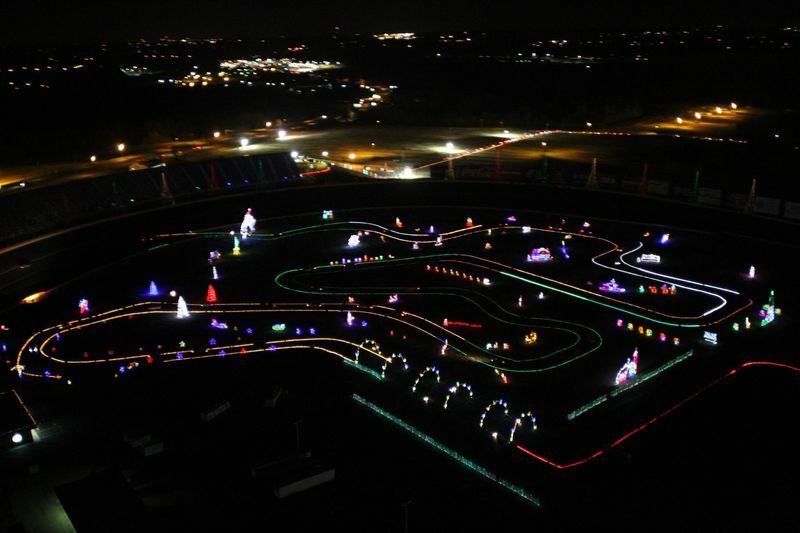 More than 3 million lights in 800 displays, located in the infield and the unique opportunity to drive the race track. A Christmas Village (Thursday – Sunday nights) gives visitors the opportunity to see the recreated Bethlehem Village, take photos with Santa, marshmallow roasting and a petting zoo. On Friday and Saturday nights a Christmas themed movie will play on the world’s largest HDTV for your enjoyment during the show. Cost is $20 per car or minivan (up to 8 people). The whole town of McAdenville puts on a a huge display of Christmas lights every year and has for many, many years. 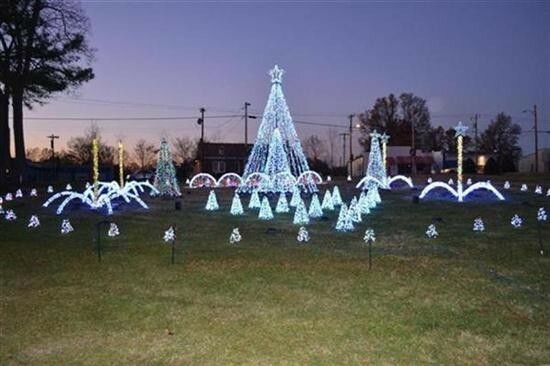 The town of McAdenville and it’s Christmas display have been featured in many national publications and television shows dating back to 1980. 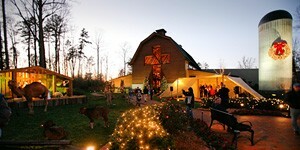 McAdenville is known as “Christmas Town U.S.A.” and is located between Charlotte and Gastonia off of I-85. Drive your car through or get out and walk the route. In addition to the show, the annual Yule Log Ceremony and Parade takes place on Dec. 14th. McAdenville’s lights are on Monday – Friday from 5:30 – 9:30 and on Saturday & Sunday from 5:30 – 11:00. This is a free event to the public. December 1st to December 23rd the Billy Graham library offers free admission to see a live nativity, caroling, Christmas story time for kids, and their Journey of Faith Tour. 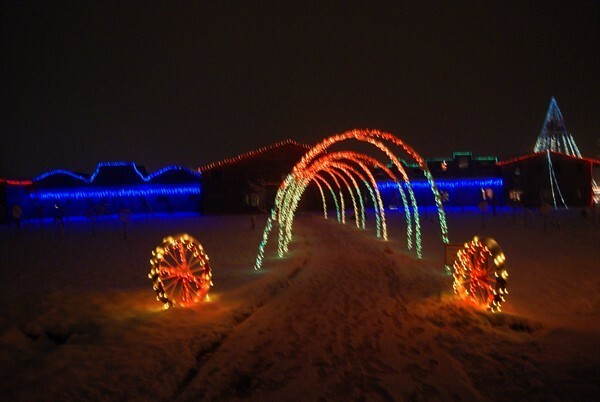 You can also Enjoy a horse drawn carriage ride ($7 adults $3 kids under 12) through the beautiful light displays. You can even have Christmas dinner Thursday – Saturday evenings. ($18.95 adult, $8.95 children). Christmas at the Library is named as a Top 20 even by the Southeast Tourism Society. Next to McAdenville, this one is probably my favorite light display in our general area. It’s a little bit of a drive (just outside of Winston-Salem) but WOW, it’s well worth it! 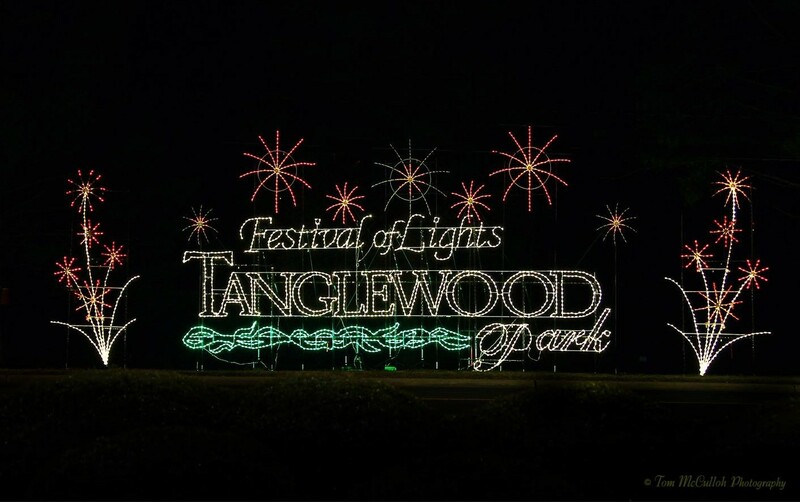 Located at Tanglewood Park, this is one of the largest and most spectacular shows in the Southeast! It is a 4 mile route with about a hundred displays. On average 250,000 visitors attend this event each year. Tanglewood’s Fesitval of Lights is a Top 20 event in the Southeast and a top 100 event in North America. In addition to all the great light displays, you can have a photo with Mr. and Mrs. Claus, stop by the Holiday Gift Village and enjoy concessions. 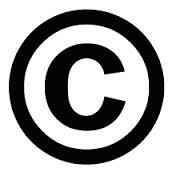 6:00 – 11:00 nightly through January 1, 2015. Cars, minivans are $15 Special Throwback nights are only $5 if you wear Santa hats.